This Data Protection policy is made in accordance with the General Data Protection Regulation (GDPR), in particular Article 13, and the data protection regulations applicable to Germany (these include the Federal Data Protection Act New, the Telemedia Act, and the Broadcasting State Treaty). Terms are therefore used in the SAME way as in the GDPR and the other Laws. 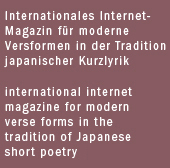 This Site offers information about Chrysanthemum, the international haiku magazine as well as the Magazine for download. Chrysanthemum is none commercial, non-profit, ad-free and free (as in free beer). We do not collect any personal data. This Page is purely passive until further notice. It does not need cookies, since there is no registration that requires any. If possible, please do not make information requests. The answer is always the same: There is no stored personal data - absolutely nothing!